The e-Up accounts for 78% of total Up sales in Norway in May. The Norwegian new car market is up 3% year-on-year in May to 12,337 registrations, bringing the year-to-date total to 60,944 units, up 2% on 2013. The VW Golf holds onto the pole position thanks to 565 sales and 4.5% share, reinforcing its year-to-date top spot at 2,908 units and 4.8% vs. 2,598 and 4.3% for the Tesla Model S back up 13 spots on April to 6th place this month with 3% share. 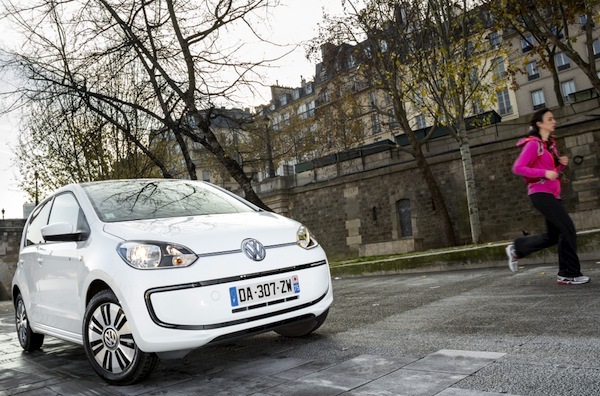 The event of the month is the 2nd place of the VW Up, its best-ever ranking in the country, with 465 sales and 3.8%. The Up is up 222% year-to-date to #6 overall, and this newfound success is almost entirely due to the electric version, the e-up, accounting for 78% of Up sales in May and 77% year-to-date. Other great performers this month in Norway include the Skoda Octavia up to #3, the Audi A3 up to #13, Citroen C4 up 46 spots on April to #29 and the Mazda3 up 27 to #31. Finally, notice the BMW i3 down 13 ranks to a still very satisfying #28 spot. Full May 2014 Top 100 models Ranking Table below.